One small sip for a man, one giant gulp for mankind. With sixteen sunrises every "day" on the International Space Station, it's tempting to want coffee around every pseudo-breakfast time. Soon, a quick espresso will be available to recover from space snoozing. Enter the ISSpresso machine, an authentic Italian espresso machine that will be sent to the space station in November, coinciding with - what else? - Italy's first female astronaut's six-month mission aboard the ISS. Fighter pilot/astronaut Samantha Cristoforetti is psyched about this Starbucks in the stars, tweeting, "How cool is that? I'll get to operate the first space espresso machine!" Created by espresso veterans Lavazza in conjunction with Italian engineering company Argotec, the ISSpresso machine has steel tubing (instead of plastic) for durability, and is designed with switches similar to other ISS elements so that it fits right in with astro-protocol. As reported to www.cbc.ca, American astronaut Don Pettit was pleased to hear about the ISSpresso. Pettit is a former space station astronaut and micro-gravity caffeine pioneer: during his space stay, using a clear plastic folder cover, he invented a teardrop-shaped "cup" to drink coffee from (the shape helped retain what would otherwise be free-floating globs of coffee if poured like normal on Earth), rather than sipping from a pouch with a straw. Though he laments that the low gravity will not allow for traditional espresso foam to rise to the top of a cup, he still admits that, "It would be the best coffee that we've ever had in space." 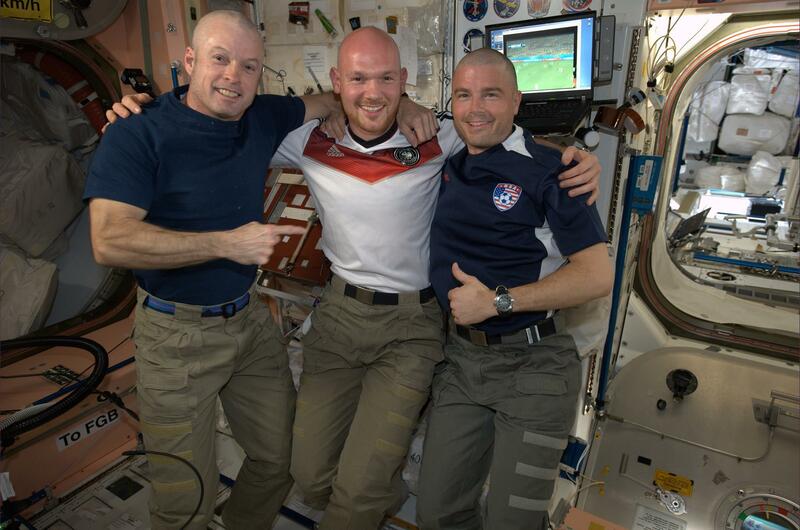 In other ISS news this week, the U.S./German World Cup rivalry reached a fever pitch with Germany's 1-0 win against the U.S. on Thursday. 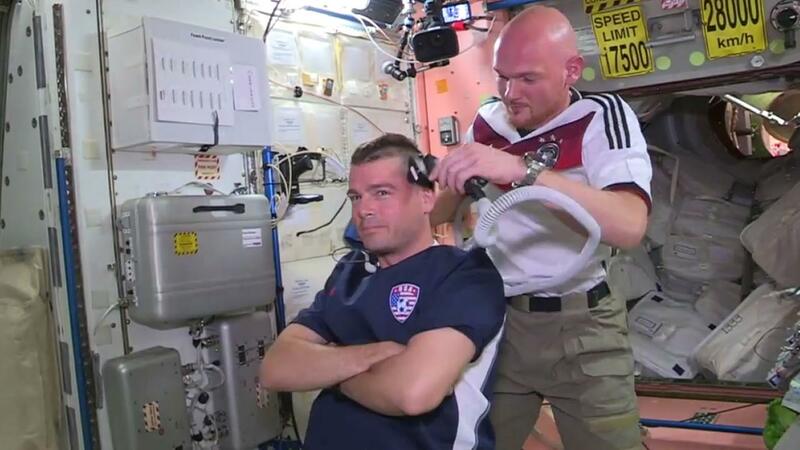 American astronauts Reid Wiseman and Steve Swanson lost a gameday bet to German astronaut Alexander Gerst, and were thus bound to have their heads shaved as penalty (Gerst has been rocking a stubble-free skull since his arrival on the ISS.) The Americans took their loss well, with www.space.com reporting that NASA's Mission Control in Houston radio'd up some support: "Our condolences on your loss today for Steve and Reid...Flight wanted to point out that bald is more aerodynamic when flying." German astronaut Gerst takes his victory over US astronaut Wiseman using the ISS's vacuum-enabled space shears. Gerst later tweeted this image, stating, "Mission Accomplished!" Gerst (a.k.a. Astro_Alex) also supports the Chilean soccer team, and thus shared from space this cool picture of volancoes in the Andes. Check out his Twitter feed for more amazing astro-snaps.